The painting of Viktor Efremovich Popkov “The Builders of Bratsk” refers to the heyday of the Soviet visual arts. 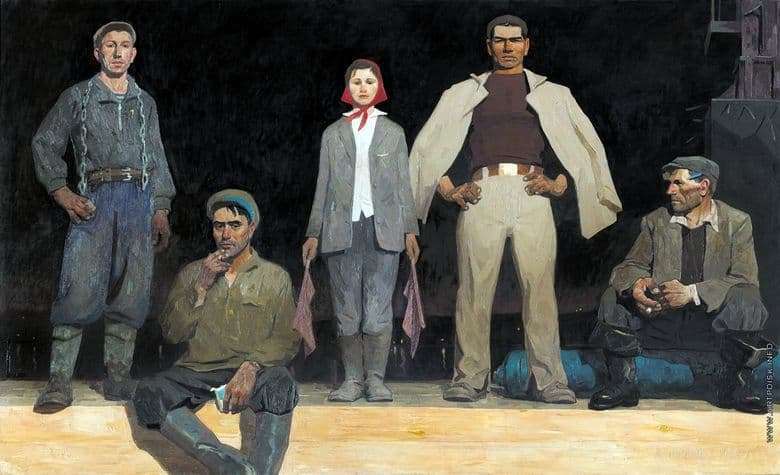 The canvas, created in 1960, is considered a model of “austere style” in which artists glorified the heroic everyday life of the Soviet people. It depicts workers employed in the construction of the Bratsk Hydroelectric Power Station. They are shown not in the process of labor, but look sternly at the viewer, allowing you to get a better look at their tense faces, big callused hands. This is the trend of the thaw, which Victor Popkov took to the full. After a long period of perception of people as a mass, the creative interest returned again to the rich and controversial world of the individual. Builders of Bratsk Victor Popkov sees the personification of a dark era. That is why they are drawn up with great attention to every detail of the exterior. The painter worked on etudes of painting exclusively at night. Time. The artist deliberately sought the effect of contrasting silhouettes with a black background, drawing a parallel with the faces on the icons. The heroes of the canvas, despite the deliberate poster, are real people from among the artist’s friends. Some of them were depicted with camp tattoos, but, fearing the wrath of the authorities, the artist removed them. The picture was created after the trip of Viktor Efremovich to Bratsk – to the place of the largest construction at that time. The huge reservoir created by the Soviet people made an indelible impression on the artist. And he conceived an epic canvas, the heroes of which were simple Soviet workers.